Ghastel is the leader of Lucifer's demons. Ghastel can fly by creating a dark clouds beneath both his feet. 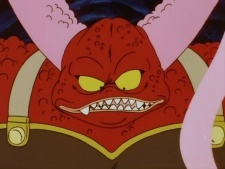 He attacks Krillin and Goku and eventually chases them through the cavernous area, but is killed when they trick him into being eaten by a swamp monster.